Daily visits to our garden to get encouraging images like these make the whole frustrating project worthwhile. We've had lots of unseasonal rain in the last few weeks, which has been great for our endangered wildflowers. I have a new Canon PowerShot this year, and our visiting film student son Andy has helped me figure it out. I'm doing better at getting the shots I want, and I'm eager to share them. I just uploaded a batch to a Flickr photo set, which I've embedded here as a slideshow. (If you are reading this post by email, you will have to visit my blog to see the slideshow.) The photo set on Flickr has more detailed general information about the project, captions for most of the photos, and links to other related photo sets and blog posts. P.S. If you're a new email subscriber, you might not have noticed that the highlighted text (like this: Tryangulation) is actually a hyperlink, to make it easier for you to find the websites I mention in my blog posts. Last week when I shared our little flower's survival of winter and good intentions, I prefaced my post with a line from a Robert Frost poem, Mending Wall. While I was setting up the previous post just now about a local newspaper covering the reappearance of the flowers in the wild, I sorted through my own old photographs, too impatient to hold out for this year's crop of photos. I found this one, which I had taken a couple miles from where we collected seeds. This image is perfect for another of my favorite Frost poems, The Tuft of Flowers, which, in its own way, is also fitting for all kinds of virtual co-labor. Even though his coworker is still out of sight and earshot, this shared beauty unites their spirits and joins their separate tasks into one labor. We too can find things of beauty and leave them for our co-laborers in the next field, or across time. It was encouraging to see in the Today's Zaman online edition that our little flowers --or rather their still wild cousins-- got some press. Last year I didn't go out to the meadow where we collect seeds, so I didn't realize until reading this new article by Zaman that they were down to an area of only 30 square meters. I'm going to use that news article to do some campaigning! Newer readers might not be aware of my contentious school project to protect the beautiful and critically endangered Centaurea tchihattcheffi (yanardöner in Turkish). The natural habitat of this nearly extinct species of the cornflower family is in the vicinity of our school, and for the past few years two of our science teachers and I have bravely fought to propagate seeds on our campus (click here for photos and text from a happier time). The flower's habitat is threatened by large scale agriculture, Ankara's urban sprawl and, ironically, its failure to be noticed (behavior which I have commented on before). After first collecting seeds in the wild (natural habitat pix here), we carefully prepared a plot close enough to be observed, but just out of the school bus and recess commotion. For a couple years following, we (that is, I) collected seeds, cleaned and sorted them, and then recruited students and colleagues to get a little dirty in the name of species diversity, sowing the seeds in our gradually increasing garden. Who would have thought three years ago that we ourselves were a threat to our centaurea's survival? Like I wrote recently concerning the local aversion to disorder, straight lines and right angles are the norm for flower gardens, and our nonconformist self-seeding weeds were a threat to that system. Our well meaning grounds crews and I were constantly in a race, they to restore order, and I to protect disheveled nature. As soon as I got one crew and crew chief on board with the project, they would be reassigned and new workers would show up, hustling to clean up the mess their predecessors apparently had left behind. I was away for the entire fall semester this year, a critical time for fending off welldoers. When I returned to school in February I was disheartened to see that orderliness had finally won out: the garden was neatly hoed and planted with shrubs in straight little rows. The notion of death by PBL crossed my mind. A few weeks ago I finally went out to see if anything had survived, and felt the faintest whisper of hope when I found that there were, in fact, a few buds creeping out of the ground. I went back today and saw that quite a few more were popping up at the edges of the plot. 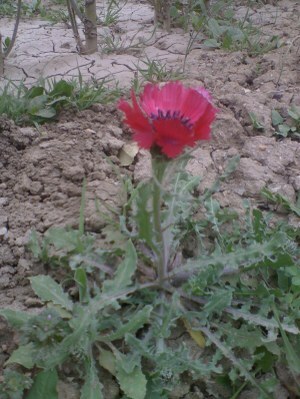 I found the newest commander of the gardeners (the 4th in the lifetime of this project) and together we assessed the state of the plot and agreed on a plan and a compromise: once the centaurea were in bloom and easy to spot, workers could go in among them and pull up the other less desirable weeds. While we were examining the grounds, we found that two had bloomed. I took some quick shots with my mobile phone, as evidence that our project had survived all our best efforts at project based learning. The title of this post is adapted from the poem Mending Wall, by Robert Frost. The photo is unretouched, taken under heavily overcast skies. I just had a great experience participating in NECC (National Educational Computing Conference) in Atlanta, Georgia, from my desk here in Ankara. Around the same time I wrote a post about project-based learning I got in touch (via Ewan) with Jane Krauss, who has just written a book with Suzie Boss titled Reinventing Project-Based Learning: Your Field Guide to Real-world Projects in the Digital Age. Jane and Suzie also write a blog on the same theme and created a Flickr group to collect photos of school projects around the world. Yesterday in Atlanta Jane and Suzie gave a presentation on project-based learning. They surprised me by inviting me to join in the presentation via Skype, along with Linda Hartley in the UK. It was a little strange talking to a room full of people I couldn't see, and because of the headphones I had some trouble hearing my own voice as well, but still it was very cool and fun. Linda created a wiki to write a summary of the presentation. 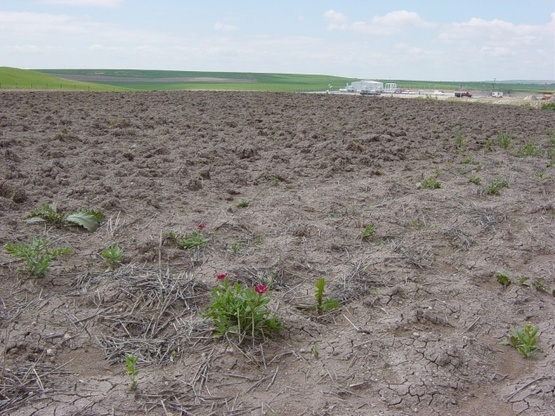 Our school is in the vicinity of one of the last remaining habitats of a critically endangered wildflower that in Turkish is called yanar döner (Centaurea tchihatcheffi). Teachers and students had been thinking about how the school could get involved in this problem, but a lot of the thinking was limited to what students could do inside the school building, so most of the suggestions were for creating a website, slogans, a poster contest in the school, and other media projects targeting the school community. I conducted a simple problem analysis exercise with the students and one of our biology teachers, where we stated the problem (threat of extinction), and then ask why (loss of habitat). You ask why again (urban sprawl, intensive agriculture), and keep asking why until you get the big picture that shows how this problem relates to a larger system. As we looked at the bigger picture, we saw that a media campaign in the school community would not touch people who were close enough to the problem to make much of a change. But we did realize that we could take a different and more effective approach by collecting seeds in the wild and propagating them on our campus. The creative juices started flowing and we saw the potential for producing enough seeds to share with other schools in the area, and even for establishing a low-tech seed bank to help protect other endangered wildflowers in our province. Although some of our students might have felt content with a nice website and a contest, bringing in a learning tool from "the real world" helped us find a solution that could have a genuine and sustainable impact. A project I've been working on for the last two years has been the cultivation of a critically endangered wildflower that's found only in the vicinity of our school (click here for more background). Yesterday our Botany Club got in the mud to plant some of the seeds I collected this summer (about 2000!) in some new beds next to our original yanar döner plot. We also took another step toward our long term goal by adding another endemic species, Centaurea cyanocephala. There are 25 endangered wildflowers in our province, so we've got big plans for our big new campus! The C. cyanocephala are biannuals, so now we'll have to be extra careful to make sure that our well intentioned school gardeners don't clean and hoe the area next summer. To see what we did and how we managed the problem of the biannuals, look at my Flickr set here. Some of the photos have notes attached to them which you can see if you pass your mouse pointer over the image. Maybe this will give some you new ideas for using photographs in your lessons. As winter approaches, we'll start work on the the club website, and I'm looking forward to trying some other cool tools with the group. After many weeks of sharing ideas, making plans, getting expert advice, adjusting our plans, and talking the project up to just about everybody, we have succeeded in making TED's yanardöner wildflower population more permanent and secure. To get some of the background, see posts (here and here) at this blog's previous address. We now have officially desginated about 35 sq. meters on the campus for sustainable seed production for aesthetic, experimental and conservation purposes and - just as important - it looks like we have all the key stakeholders on campus buying into the common goal of protecting and enjoying this beautiful and endangered wildflower in the most sustainable way possible. To see the source of our inspiration, check out my photo set of yanardöner and peygamber çiçeği in their natural habitat on Flickr. The photos are of our seed planting ceremony on 26 Oct 2005, with special honored guests Mr. Süha Günel, our General Director, and Mrs. Melike Toklucu, our High School Principal. The seeds we planted were collected last summer from flowers growing on campus, and our expanded flower bed incorporates smaller plots where the flowers have already begun to naturalize. We learned that the seeds need to spend the winter under snow for the best germination, which is why we're planting the seeds now instead of in the spring. I'll keep everyone posted on our progress.